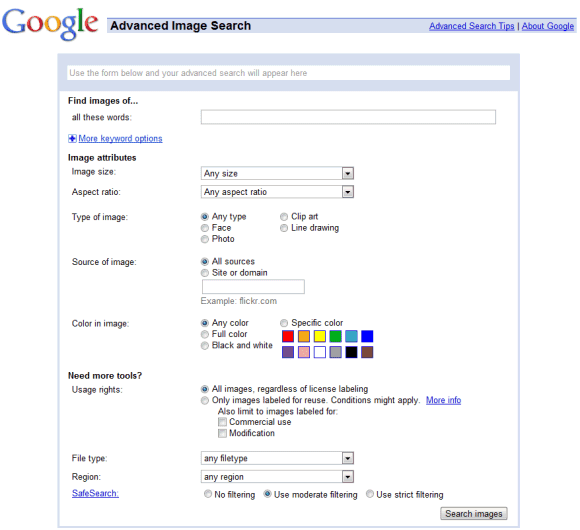 Google updated the interface of the advanced image search page to look just like the corresponding Web search page. The redesigned page is easier to use, it groups the search options and includes some of the options that were only available in the sidebar. Why use the advanced search page instead of using the sidebar? Some of the options aren't available in the sidebar: restricting the results to a filetype, finding Creative Commons images, finding images from a domain or from a country. There's one feature that's no longer available in the new interface. Can you find it? Use my desktop size. I miss it! For my opinon, all the individual search preferences should be stored on the cloud and be loaded when same user is logged in from anywhere else. The new interface looks simpler & cleaner.